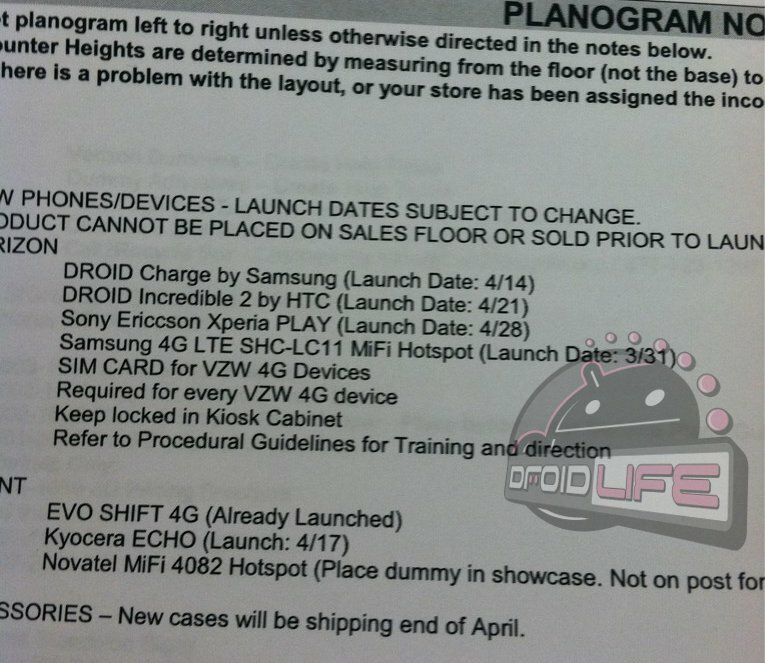 Last week, a Verizon roadmap leaked out which showed the release dates of almost all of their new phones including the Incredible 2 and DROID Charge, but things may have changed slightly which only makes sense since the Charge didn’t make that original April 7 date. According to the sheet you are looking at above (image removed), Sears (Kmart) plans to start selling the Charge next Thursday (April 14) with the Incredible 2 following up right behind it on April 21. The Charge doesn’t come as a surprise especially since we’ve seen accessories already arriving in stores as of today. The Sony Xperia PLAY will then finish out the month on April 28, making April insanely busy for us in the mobile phone industry. Anyone jumping on any of these?